Did you ever hear a situation being described as A Purim Story? It means a crazy, mixed up series of events that do not seem to make sense, but in the end, all work out. That is Purim in a nut shell– an ancient story of court intrigue, deception, miscommunication, drunken parties, assassination plots, a foolish king, a delinquent queen, villains, a strong hero and one beautiful heroine. For one little holiday, Purim certainly has it all. It is a one-day, carnival-like celebration in Adar, which occurs in late February or early March in the secular calendar. Purim commemorates events that took place 2,500 years ago just after King Achashverosh consolidated his rule over the Persian empire. According to Megilat Esther, which is Hebrew for the Scroll of Esther, Achashverosh’s empire stretched from Hodu ad Kush, which on today’s map, would mean from Ethiopia to India. To celebrate the expansion of his empire, King Achashveyrosh and his court feasted for six months. It was during one of these feasts, and after a lot of food and wine, that Achashveyrosh called for his wife, the proud Queen Vashti, to appear. However, Vashti, who did not appreciate being summoned on demand, refused. The Midrash, which is a series of biblical commentaries, says that Vashti refused out of modesty, because she was summoned in order to dance naked in front of the King and his friends. Another version is that Vashti refused to appear out of vanity, because she had a blemish on her face. Whatever Vashti’s reason, when she did not appear, the King became very angry. His advisers, fearing their own wives would take courage from Vashti and become similarly disobedient, told the king to have her killed. With Vashti gone, the foolish King is advised to stage a beauty contest to pick a new wife. A beautiful Jewish orphan named Esther is chosen as the new queen. Esther, whose Hebrew name is Hadassah, was raised by her uncle Mordechai, an important Jewish religious leader. Mordechai, sensing a divine plan, tells Esther not to reveal that she is Jewish. Soon after Esther becomes queen, Mordechai overhears an assassination plot against the King. He reports the conversation to the palace, and the two perpetrators, Bigthan and Theresh, are apprehended and killed. The incident is recorded in the king’s chronicles, and, although Mordechai saved the kings life, his efforts go unrewarded and are quickly forgotten. Meanwhile, a power-hungry courtier named Haman is appointed as the King’s new Prime Minister. Haman quickly passes an edict that all must bow before him. Mordechai incurs the wrath of Haman by refusing to bow. After complaining to his wicked wife, Zeresh, Haman decides to take revenge on Mordechai by convincing King Achashverosh to decree that all Jews be executed. Lots are cast and a day is chosen for the annihilation of the Jews. That day, of course, was the 14th of Adar, the day we celebrate Purim. Mordechai tells Esther that it is because of Hamans evil plan that she, a Jewish woman, has become queen and that she must plead with the king to save her people. After some initial reluctance, Esther agrees, and in preparation, she and her people fast and pray for three days requesting Divine assistance. When she is finished, she has a plan. Esther decides to visit the king uninvited, an act punishable by death, and invite the king and Haman to a special banquet. At the banquet she eludes Achashverosh’s questions and invites the king and Haman to a second banquet. Haman is elated that he is so honored, and hurries home to tell his wife. On his way, he bumps into Mordechai. Haman can’t wait for the day of the planned massacre, and at the advice of his wife, he erects huge gallows in his yard. He rushes back to request the king’s permission to hang Mordechai the next morning. That night, King Achashveyrosh had trouble sleeping. To pass the time, he asks that his book of chronicles be read out loud. The chapter read to him is about the time Mordechai revealed an assassination plot against him. He is told that Mordechai was never rewarded. Haman, who just happened to be in the palace, overheard the king wondering how to reward such a man. Haman, who assumed the King wanted to honor him, advises the king that the lucky one should be adorned in the king’s robes and crown, paraded through the streets on the king’s horse, and proclaimed as the king’s honored subject. The king likes Haman suggestion so much, he informs him that he is to lead Mordechai through the streets of Shushan, the capital. Haman, is stunned, but has no choice but to fulfill the King’s orders. After this humiliation, Haman attends Esther’s second banquet. It is there that Esther reveals that she is Jewish and exposes Haman as the evil plotter against her people. The king is so angry that he orders Haman killed. However, the king is unable to rescind Haman’s decree against his Jewish subjects since it already bears the king’s seal. Instead, he allows the Jews to arm themselves and fight. So, on the thirteenth of Adar, the Jews defeat their enemies in the provinces, and on the thirteenth and fourteenth of Adar, the Jews defeat their enemies in Shushan and in the cities. The day turned from grief and mourning to one of joy for the Jewish people when Haman and his 10 sons were killed on the very gallows erected to kill Mordechai and the Jews. In fact, the joy of Purim is so great, we are told, that even in Messianic times, unlike other holidays, Purim will be celebrated. It is important to note that there are secular scholars who question the literal truth of Esther’s story. Some say it is a version of another genocide attempt during the reign of Xerxes II (485-465 B.C.E.) or Ataxerxes II (403-358 B.C.E. ), both of whom have been identified as Achashverosh. Our sages have their own theories about Esther’s story, which they discuss openly in the Talmud. An entire tractate of the Talmud called Megillah discusses various issues regarding the book of Esther. It is here that the rabbis explain that Achashveyrosh’s reign coincided with an earlier prophecy made by the prophet Jeremiah. The prophet said that after a period of seventy years following the destruction of the first temple, the Jews would return to Israel to build a second temple. The rabbis say that the third year of King Achashveyrosh’s reign was the date he mistakenly calculated to be the end of the seventy-year-old prophecy. When the king saw that the Jews of his realm were not leaving, he celebrated with six months of feasting. The rabbis said that when the Jews actively participated in the six-month-long series of parties, they were actually celebrating their own exile from the land of Israel. The rabbis concluded, that by abandoning their belief in G-d, and assimilating rapidly, the Jews forgot the need to be wary of those who would persecute them, in this case, Haman. The story of Purim presents the eternal story of the Jew threatened in a strange land. For this reason we are commanded to read the Book of Esther. Still in exile, Purim is a reminder that we, as Jews, must resist becoming too complacent in our lives. The impact of this miraculous rescue from certain death was so great that its commemoration became an integral part of Jewish tradition. The text that we read to this day was edited and canonized between the fifth and fourth centuries B.C.E. by the Men of the Great Assembly, or in Hebrew, the Ansei Knesset Ha’Gdolah, the governing Jewish body of which Mordechai was a member. 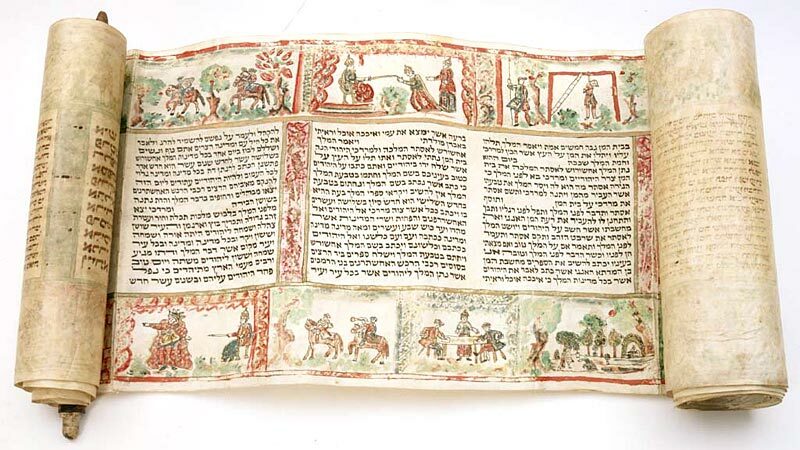 In fact, it is believed that the Megillah, as we read it today, is based on letters written by Mordechai and Esther, documenting the events they witnessed. By the end of the second century, the Megillah was being read publicly Purim morning. The rituals associated with the holiday were formally established during the following century. Throughout the Middle Ages, the foods and entertainment that we take for granted today were established. The joy was so great that ever since, Purim, which stood for victory in exile, has been celebrated with community and family parties, masquerades, parodies, (called Purim Shpeils), plays, food baskets, and festive meals. A third century Babylonian teacher named Rava said that on Purim one should drink enough wine until one does not know the difference between arur Haman and baruch Mordechai, ‘blessed Mordacai and cursed Haman. 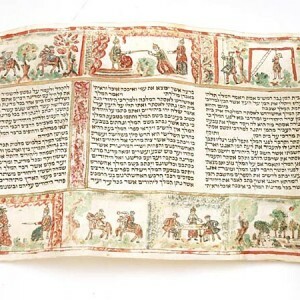 The Hebrew phrase, Ad-de-lo-yada, until one doesn’t know, was quickly adopted as an important Purim theme, and was the motto for the first official Purim carnival held in 1912 in downtown Tel Aviv. Since then, carnivals and costume parades take place each Purim in cities around the world.